Bundle includes Delta Children Table and Chair Set with Storage & Delta Children Wooden Double Sided Activity Easel with Storage. 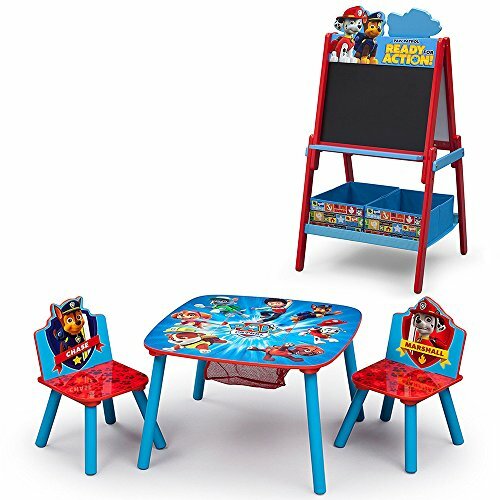 Your kid's favorite crime-fighting canines come to life on this Paw Patrol Table & Chair Set w/ Storage from Delta Children. Featuring colorful graphics of the coolest pack of heroic puppies and their tech-savvy leader, Ryder, the spacious tabletop with built-in storage in the center makes tackling homework, crafting or snack-time so much easier. Sure to inspire the sweetest sketches, this Paw Patrol Wooden Double Sided Activity Easel with Storage from Delta Children is designed with a magnetic, dry-erase surface on one side and a chalkboard on the other. Featuring a cute silhouette of your child's favorite canines on top, it includes a magnetic character puzzle, alphabet magnets and two fabric bins underneath, so your child can store chalk, markers and all their works of art.